Stage at the Live Achrafieh Festival. Sorry the pics are so awful. Last night, our hosts surprised us with a special outing, just up the street from our hotel. 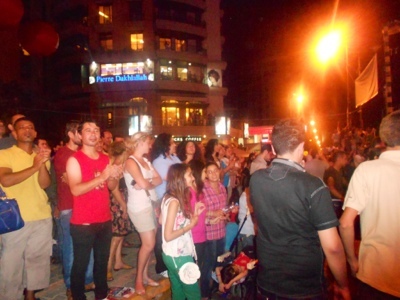 A square in Achrafieh (our suburb of Beirut) had been closed to traffic, and a full stage/sound system/jumbotron system was set up for the Live Achrafieh Festival. I was completely wrong. It was such a loud, noisy, joyous event. 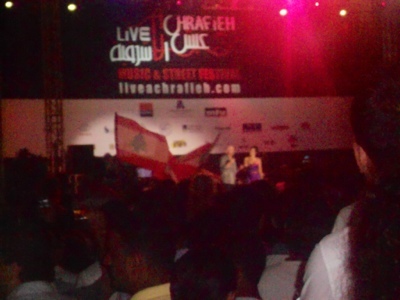 Free concert aside, people of all generations were in the streets singing, dancing, and waving Lebanese flags. I can’t think of a concert would get a cross-generational attendance together in the same way in the States. Our group immediately integrated into the crowd, with many of our members dancing and interacting with people. I’ve got a short video here that really doesn’t do anything justice, but will give you a feel of the sounds of the concert. The square in Achrafieh that the event was at has a memorial in honor of Bachir Gemayal, former Prime Minister of Lebanon assassinated in 1982. And yet, at this place commemorating such a sorrowful event, there was so much joy last night. This type of event is part of why we are here on this fellowship. I think some people picture any sort of crowd in the Middle East as something violent, unstable, and unsafe. Throw flags into the mix, and you’ve got a horrible situation. And yet last night couldn’t have been farther from the truth. I’m sure I had a ridiculous grin on my face the entire night, just watching these people be so happy and joyous, enjoying their country’s music and showing pride in their home. This entry was posted in LSF2012 and tagged Achrafieh, Lebanon. Bookmark the permalink. my day. You cann’t imagine simply how so much time I had spent for this information! Thank you! Thank you for taking time to comment!! energy to put this article together. I once again find myself spending a lot of time both reading and posting comments. The perform of music changed with who the particular person was listening with.